Happy Thursday! I am definitely happy we're starting the downward slope toward the weekend. The time officially changes this weekend and as happy as I am that it will be lighter later I'm not sure if I'm ready for losing an hour. Especially when that means it's back to being pitch black when I leave my house to go to work. But that does mean warmer weather and longer days so I guess I'll take it! Speaking of warmer weather, I enjoyed some amazing temperatures at Disney this weekend so I took full advantage, spending as much time outside as possible. Love the stripes and the back is so perfect! Y'all are just darling together :)! Such a cute and comfy outfit. The back to that shirt is so surprising, but would be perfect in the summer to stay cool! Just love those Minnie ears, too. Too cute! Love, love, love your comfy, cute outfit! 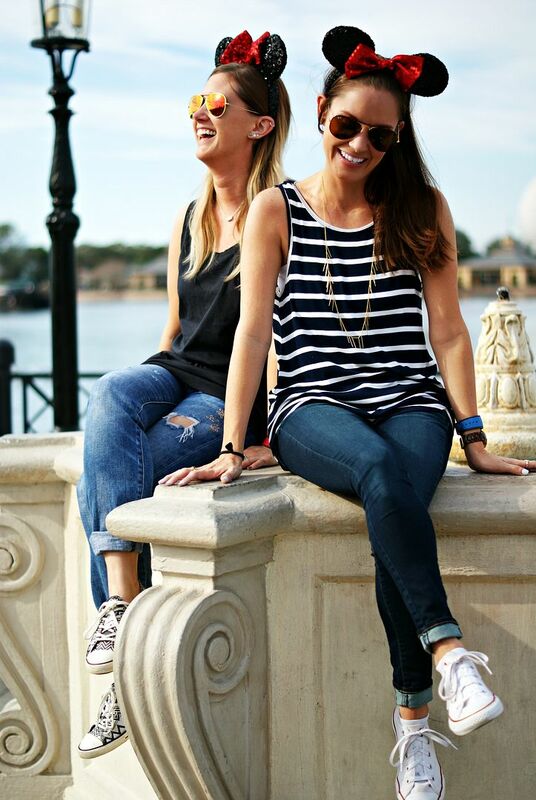 And love that the photos were taken at Disney! Disney World is definitely at the top of our vacation destination list! Can't wait to go someday! Also, one perk of living in Arizona is NO time change! It's the absolute worst when you have kids... adjusting their schedule every 6 months? UGH! So glad I don't have to do that anymore, ha! I LOVE it...so classic with the stripes and chic in the back. Perfect top for a warm day...that picture of you and Kerri- I just love it so much! i LOVE our impromptu photo shoots. you have taught me well haha. i am so not a fan of the time change happening! blah. it's been nice having it so light out in the morning. anyway i love that tank on you with the bralette! it's so cute! need to stock up on cute tanks for summer! This is the perfect Disney outfit...if I ever get to go when it isn't hot as anything,I would so wear this! A perfect comfy yet adorable outfit! You are seriously the cutest! Cute and comfy- and LOVING the back of this top + bralette. So fun! WOW!! Loved this look from the beginning, but when I saw the back of your tank I was sold!! Great detail! Love it! So cute! These pics are so adorable! In love with this top! You know I can't resist a fun back! That top is gorgeous!! And I love that bralette you paired it with! LOVE the back of that top! And you and Kerri could NOT be cuter! Such a cute top, I love the back! This is such a cute look for the parks & just a casual weekend! Love the back of that top!! 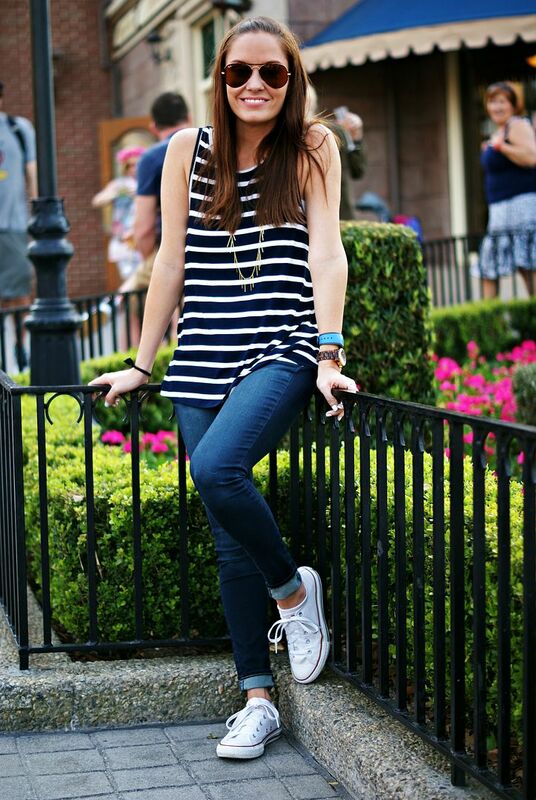 This is the perfect outfit for Disney and comfy walking shoes are a must! Did you cut your hair? It looks shorter. You look so adorable in this outfit. Although I try to look 'cute' when I go to Disney, I always feel like I look like a hot mess - I'm going to blame that on the kids ;). You look so cute with the Minni hairband. It is a really great casual outfit. 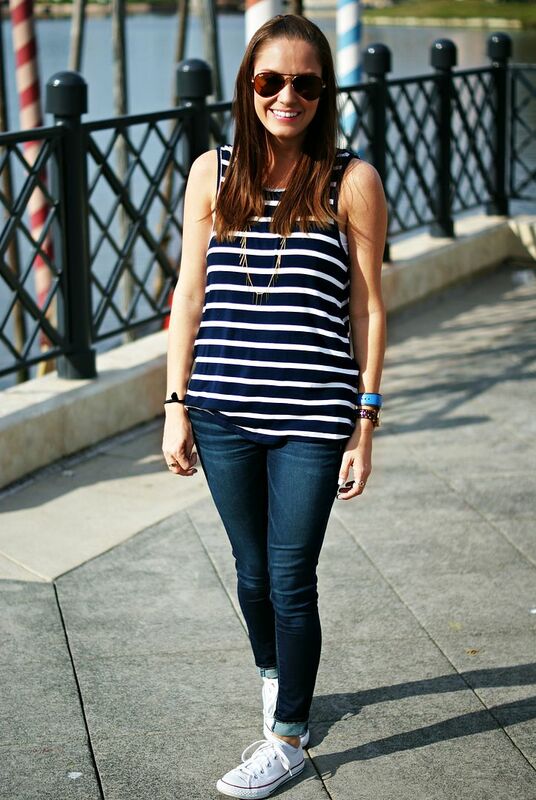 Such a great casual look! I'm loving that tank! 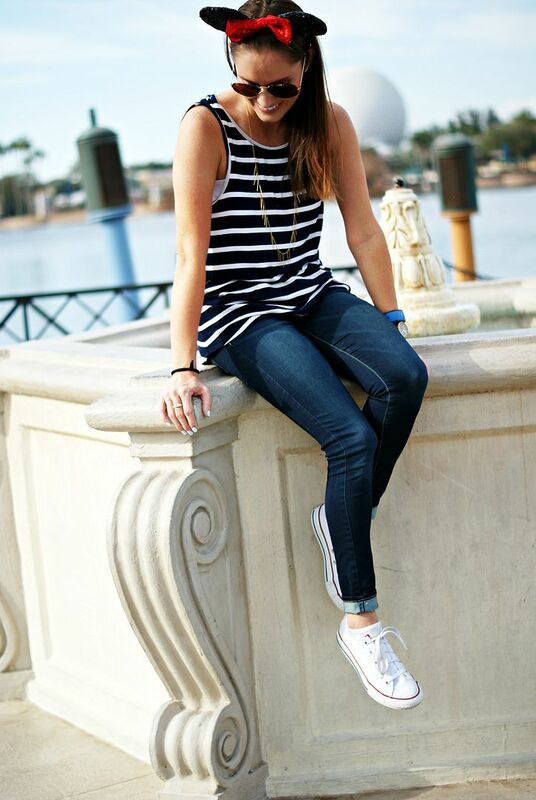 You can never go wrong with something that's striped, and the back of that shirt is so pretty! I bet that you get a ton of use out of it this spring and summer! That picture of you and Kerri seriously is the cutest! I love y'all's ears so much! Blue and white stripes are my fave and I love the bralette under it!! Love the lighting in these shots and I've never met a striped anything that I haven't liked! Such a perfect summer top! 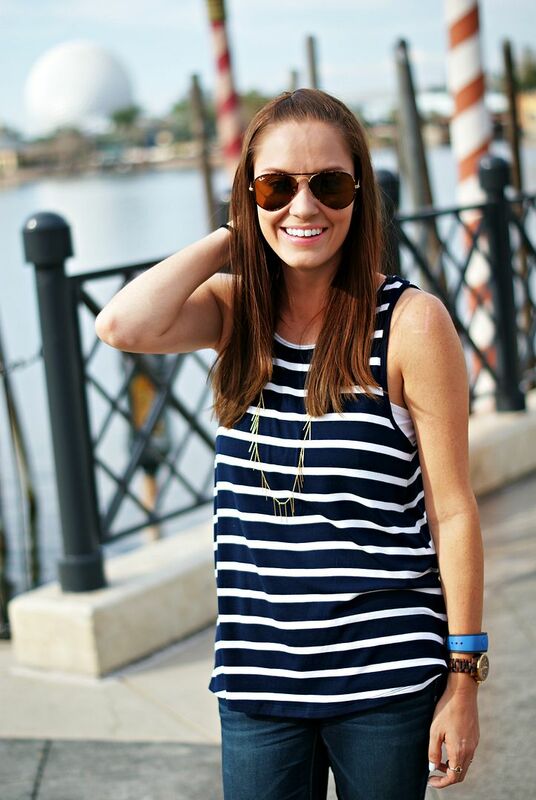 Navy and white always remind me of the beach with the nautical vibe and that just makes me happy! Absolutely love the fun back of that top paired with the fun back of the bralette! Stripes are always my go to - especially black and white - you can never go wrong! Love it! Very comfy look! cute headband! super cute outfit! and seriously, that picture of you two at the end is pretty fabulous! I love an open back shirt, so cute! I love wearing my Converse all the time! 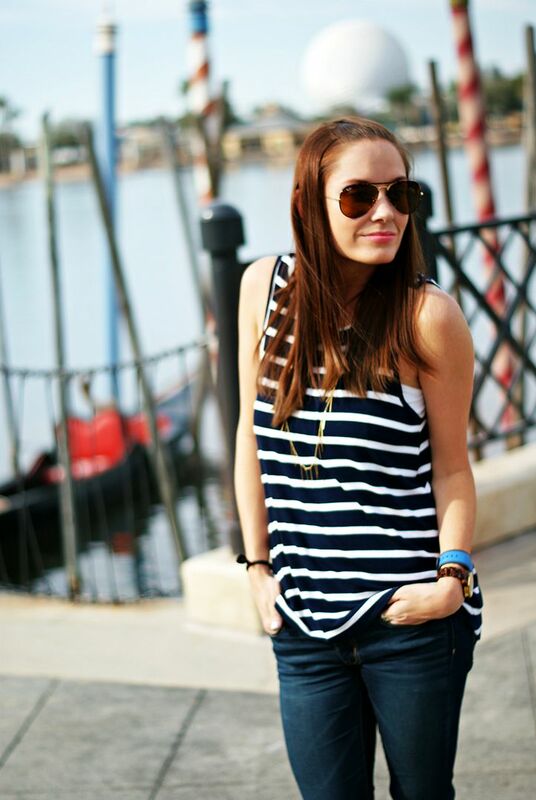 Such a cute look with the stripes!